My company had a promotion celebration on Friday and I ended up at the bars with a bunch of 20 something’s until after midnight. As I am well past my 20s I did not get much done on Saturday. I did however get the dividers installed on my plane rack; still need to add some sub dividers but at the moment it holds all of my users and freed up a lot of space in the garage. I have left some space for future acquisitions; in particular a #4.5 or a second #6 would be nice. From left to right: #10 in bad need to rehab, 1970s #4, #5 (with the prettiest handles I have seen), #6, WWII era #7, and #8 with replacement handles. The dividers are ¼” by ¼” square dowels from the hardware store which I glued down, holding them in place with blue tape and the planes acting as spacers. It still needs doors but at the moment it is functionally done. Last night was a very productive night. After my son went to bed I got into a groove and worked until my wife told me it was nearly 10:30 and time for bed. 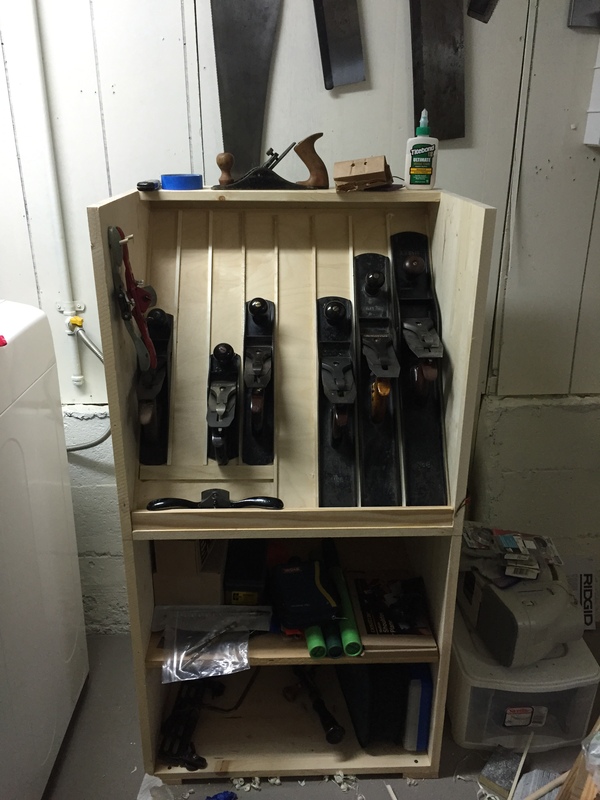 I managed to finish the closet build out and make quite a bit of progress on my plane rack. 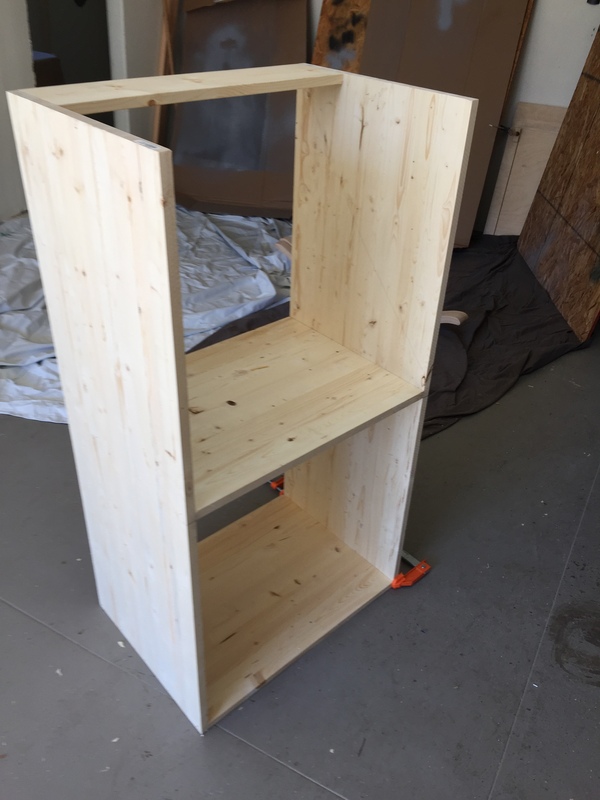 I added shelf pin holes to the lower section, put in the basic parts of the rack itself, and closed in the back of the lower section with ¼ inch Baltic birch plywood. I have been trying to use up a bunch of the leftovers in my shop to clear out some of the clutter so it has been fun altering the design to match what I have on hand. 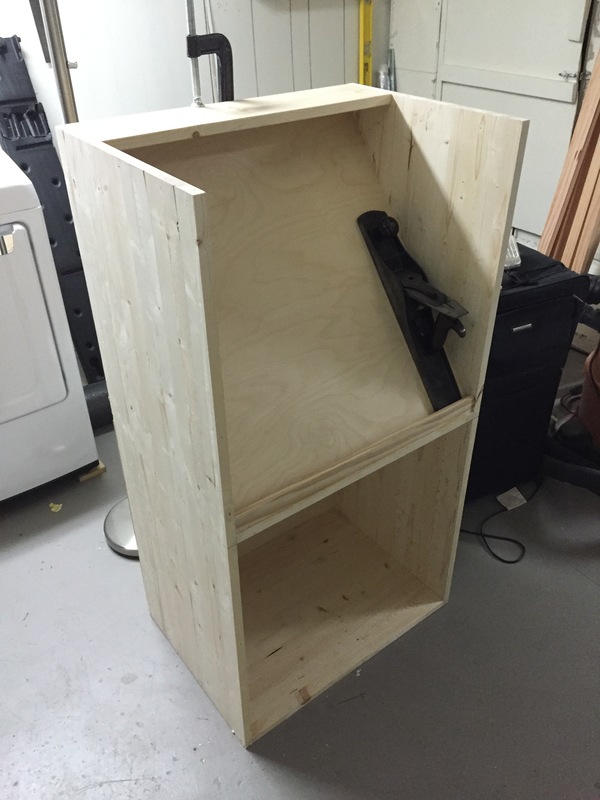 To make it functional I just need to add the dividers to the rack and cut out a shelf for the bottom; I can add bottom doors and a lid at a later date. I am debating what to do for the bottom; my garage has a severe slope built into the floor to assist with drainage (house is built into the side of a hill so drainage is a concern) so there will need to be a base to level the stand. 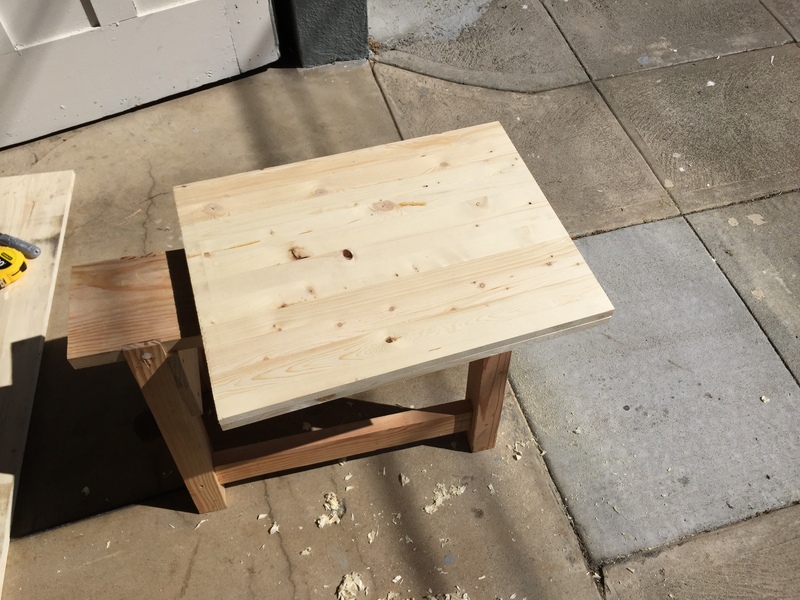 I have some 2.5” x 2.5” pine I found when we moved in and I think I will cut some short legs to lengths that will balance out the slope. This means it will be hard to move it to a new location but the need for an earthquake strap (this is San Francisco after all) makes it difficult anyway. In addition to working on the Rocking Dinosaur, last weekend I also made a lot of progress on garage/shop organization and cleanup. One thing that is particularly lacking is hand tool storage and currently my planes are sitting on flimsy card table covered with an old sheet. While we were at the hardware store on Sunday picking up supplies for the closet build out, I notices some inexpensive 18”x48” glued up pine panels which immediately made me think “plane rack” so I grabbed three and added them to the pile. After putting the last coat of polyurethane on Dino’s rockers, I laid out the panels in the driveway and used my Stanley #8 plane to figure out the best layout. I decided to keep two of the panels whole and add a cross piece in the middle to split the space in two. The bottom will have open shelves and the top would have a sloping rack that would allow easy access to the planes. 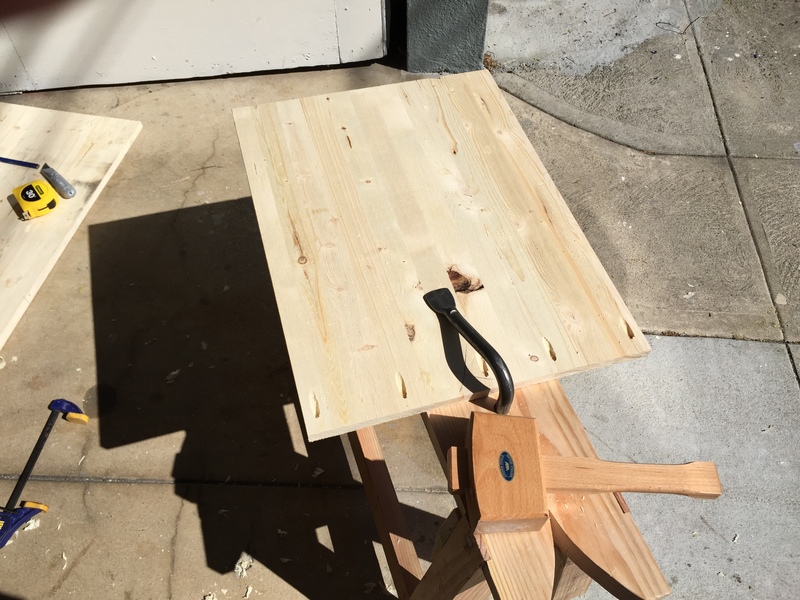 I set up my saw bench in the driveway and split the least attractive panel into two pieces with my hand saw (amazingly I am actually getting better at this, the cuts were fairly square) and compared them to ensure they were identical. 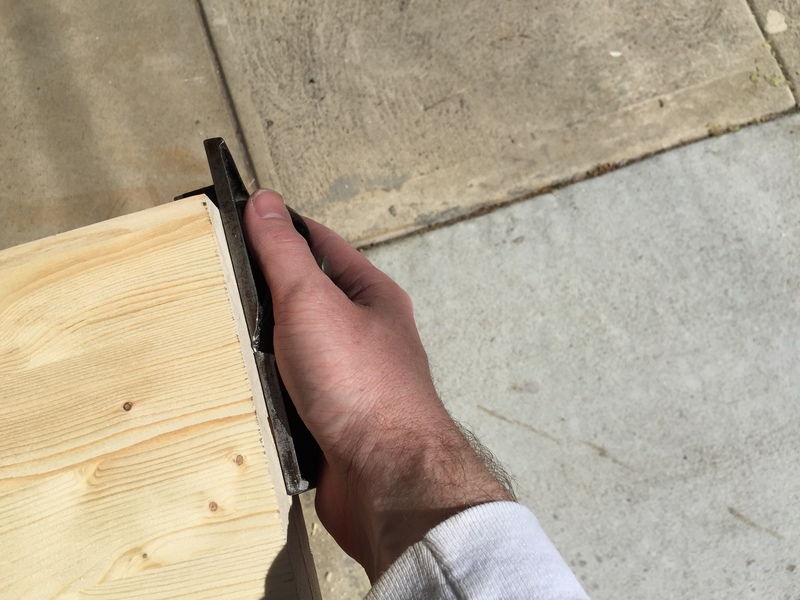 I then used my Stanley #95 to adjust the size and square up the edge. I always think this is exactly what the #95 was made for, I rarely used it after table saw cuts but when you are using hand saws it makes your life so much easier. I eventually intend to build Chris Schwarz’s Dutch Tool chest so I seceded to use pocket hole screws and no glue for the primary case work so I could easily re-purpose the wood in the future. This meant the case came together very quickly, other than needing to repair a split end. I have left the top open to allow easy access to the sloped rack (the rough position of which is illustrated with the diagonal pencil line) and I plan to build a folding lid/front in order to keep out the dust. This is as far as I made it before I ran out of the correct size of screws.